We invite our customers to visit our headquarters in New York for a one-on-one consultation with a gemologist, allowing you to view our products before purchase. Yes. Schedule an appointment to visit our headquarters in New York for a one-on-one consultation or call us at 1-888-436-7692 to speak to our gemologists who will be able to answer any questions you may have. Do you sell/ship outside of the United States? Yes. We accept orders from most international countries - you can see the complete list of countries we ship to here . Purchases can be made directly through our site. However, if you wish to place an order directly with a trained gemologist please contact us at 1-212-575-1672 or email us at info@gemsny.com. Please keep in mind our business hours and the time difference with your area. What is the difference between "Preset", "Make Your Own", and "Custom Jewelry"? All of our jewelry is made-to-order, however each process is slightly distinct depending on how much our customers want to personalize their order. "Make Your Own" is our core service, offering our customers the ability to independently select a gemstone and a setting which we will combine to create their perfect ring, pendant, or earring. "Preset" is our curated collection of items where our gemologist and designers have hand selected combinations of gems and settings for you - like shopping in a jewelry store where we display our jewelry in set combinations. Preset items are not pre-manufactured, they are all made-to-order jewelry and as such, we still offer you the option to select your jewelry metal of choice. Yes. All of our gems are 100% natural - we do not carry lab-created or synthetic gemstones - and most stones are certified by distinguished, independent gemstone laboratories - all certificates and appraisals are viewable on the product detail page. Are any of your gemstones treated? Given that 99% of colored gemstones in the world are treated, stones that are untreated are rare and carry a premium. To give our customers the greatest selection to accommodate a broad range of budgets, we offer both untreated and treated stones. Treatments enhance the color and clarity of gemstones. We only offer gemstones with commonly accepted treatments in the trade. Rubies and sapphires tend to be heat treated, while Emeralds tend to be oiled. 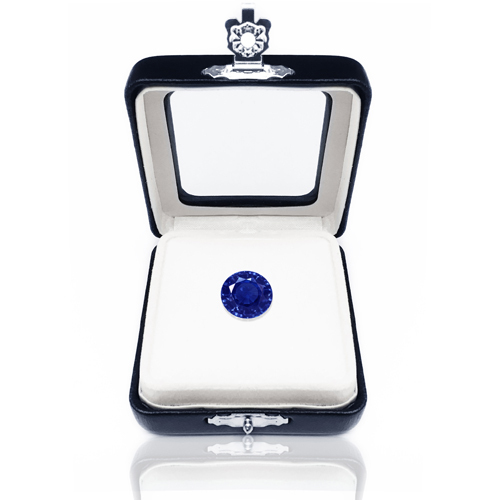 Rest assured that every gemstone on our site clearly indicates any enhancements as will the certificate that accompanies it. Find more information on various treatments and our recommendations in our color gemstone education section . Do you carry fancy colored diamonds? Yes. We carry an extensive inventory of fancy colored diamonds. However, at this time we have not been able to put that inventory up on our website. Please give us a call and speak to a trained gemologist at 1-888-436-7692 or email us at info@gemsny.com, and we can provide you with prices and specifications for the color diamond meeting your criteria. Can I buy just a gemstone? Yes, we sell loose gemstones. You can also choose to set the selected gemstone with one of our settings which can be found in the make your own sections or we can custom make a setting based on your gemstone. Please contact us if you require assistance. Can I buy just the setting with no gemstone(s)? We generally do not sell our mountings only. Please contact us regarding the mounting you would like to purchase and we can confirm availability. Can I view my gemstone before it's set? Yes. Unlike most internet retailers, our customers can visit our headquarters in New York for a one-on-one consultation with a gemologist, allowing you to view our products before purchase. Please click here for more information . Where will my jewelry be made? Where are your gemstones from? We source our gemstone from various mines around the world. You can find the origin for each of our gemstones on the product details page. 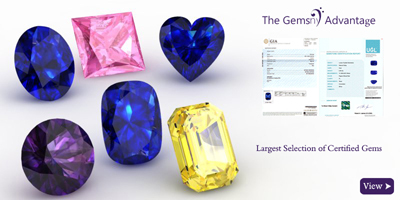 Learn more about gemstone origin in our color gemstone education section . Can you sell Burmese rubies in the United States? U.S. sanctions against Burma were ended on October 7, 2016 by the Executive Order of the President of the United States. The Tom Lantos Block Burmese JADE (Junta's Anti-Democratic Efforts) Act of 2008 had prohibited the importation into the United States of ruby and jadeite that had been mined or extracted from Burma. However, with the political reforms put in place, the U.S. is now a supporter of broad-based economic growth and prosperity in Burma. Are Burmese rubies worth more? High quality rubies of Burmese origin certified by an independent laboratory will sell at a premium in the market. No - but that's a great idea, check back soon. No. Unlike most jewelers, we don't haggle (because our website can't haggle). Also unlike retail jewelers, our mission is to provide the finest quality bespoke jewelry and single and matched-pair loose stones at wholesale prices and we believe our prices are the best out there. Let us know if you find a better offer - we haven't heard of one yet for the same quality we offer. Do you provide gemstone certificates? Yes. All of our gemstones are accompanied with a certificate of authenticity so you know you are getting exactly what you expect. In addition to our own certificates, most of our inventory is certified by distinguished, independent gemstone laboratories such as GIA and/or AGL. These world renowned independent laboratories tests each gemstone thoroughly and then create a customized grading report with the results. All certificates are viewable on the product details page. Do you provide jewelry appraisals? Yes. All our jewelry products come with free detailed appraisals. These are especially important in the jewelry buying process for insurance purposes. Rest assured our appraisals exceed the standards required by all major jewelry insurance companies. Absolutely. We offer free engraving on most of our rings up to 25 characters. Please note that engraved rings will not be returnable. Can you laser inscribe my gemstone? Yes. We provide the complimentary option to laser inscribe all our color gemstone priced at $5,000 or more. If your gem is priced at less than $5,000, we can laser inscribe upon request for a $35 fee. 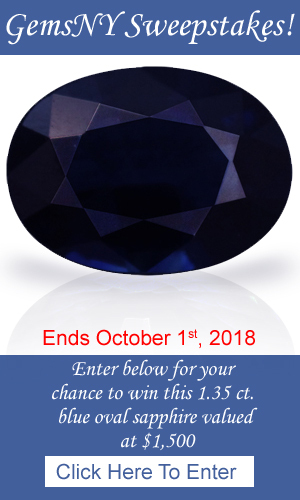 This fee covers the cost of laser inscribing the unique identifier onto the girdle of the gemstone, but does not cover the cost of updating any certificate with the laser inscribed unique identifier. If you would like the certificate to be updated, it carries an additional charge of $100 (total of $135). Please note, adding a unique identifier is currently only available for GIA certificates. The laser inscription process requires up to 5 business days and if applicable, GIA requires an additional 10-30 business days to update their certificate (they do this themselves once the inscription is set and they have the stone in hand to re-evaluate it). Please note, all sales with personalized laser inscriptions are final, voiding our 30-Day Return Policy . How do I know if my gemstone is laser inscribed? We provide the complimentary option to laser inscribe a unique identifier on all our color gemstones priced at $5,000 or more. If your gemstone is already inscribed you will need to view the gemstone's girdle under 40-50x magnification to find the inscription. If your gem is priced at less than $5,000, we can laser inscribe upon request for a $35 fee. Yes. We back the quality and workmanship of our jewelry with our One-Year Manufacturing Warranty on Jewelry . If any defects in quality or workmanship, except for normal wear and tear, come to light within one (1) year of your purchase, we will repair your jewelry item free of charge (simply ship us back the item and we'll take it from there). Please note, this warranty is void if there is any work done on the jewelry piece by a third party (e.g. resizing, cleaning, etc.). Please note, the warranty does not cover lost gemstones. We recommend insuring your jewelry items for further protection. We offer one free ring resizing within 90 days of your purchase. Simply ship the item to us and pay for return shipping. Resizing generally takes 5-7 business days. Please note that this policy is subject to the ring being resizable (e.g. eternity rings are not resizable, but would have to be remade). There may be an additional charge for resizing a ring by greater than one (1) full size as we may need to remake the ring. Can I upgrade my item in the future? Yes. Under our Lifetime Trade-Up Program we will credit you up to 90% of the original purchase price if you choose to trade-up to another gemstone or jewelry item that is at least 125% of the original purchase price of item you are trading in (for example: if you bought a color gemstone item for $100, with Trade-Up you'd receive a $90 credit toward another color gemstone item priced $125 or more). See our Lifetime Trade-Up Program for full details. Do you have a buy back policy? No. We do not buy back our products, but if you are interested in upgrading (exchanging) for another item, please see our Lifetime Trade-Up Program . Yes. We love designing custom jewelry and consider that our area of expertise. Please contact us to speak to a gemologist at 1-888-436-7692 or email us at info@gemsny.com. If you have at least one good picture or sketch of the item you would like us to produce, we can generally provide a complementary quote within 1-2 business days of your inquiry. Note: All custom orders sales are final. How can I see what my custom setting will look like? 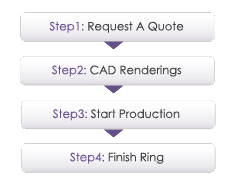 Once you've completed the Custom Jewelry Form to request a quote, our designers will generate CAD (computer-aided design) images that we will share with you before we proceed further - your approval of such renderings is required before moving to the production stage. At this stage we can make further changes if desired, or if you decide to cancel, your deposit is fully refundable. Learn more about our Custom Jewelry Process here . Is "Make Your Own" jewelry considered custom? No. Order placed for Make Your Own items as displayed are not considered custom (even though it feels that way with all the choices we give you). Make Your Own jewelry items are returnable. I like a specific piece of jewelry on the site, but can you make a change for me? Yes - all of our jewelry, be it Preset or Make Your Own is customizable. Please contact us with the changes you would like and we can provide you a quote within 1-2 business days generally. Please note customized jewelry items do not carry our 30 day return policy and are considered final sale. I know exactly what I want, but I can't find it on your site. Can you help? Absolutely. Please call us at 1-888-436-7692 to speak to our gemologists or representatives who will be able to help you find what you are looking for - with our selection of gemstones and settings and our ability to make custom jewelry it's extremely rare that we don't have what a client wants. In most cases we can accommodate special orders according to your exact specifications. I am looking for a gemstone to replace one in a setting I still have, can GemsNY set it for me? Of course. If you already have a jewelry piece and looking to replace a missing stone, we can set it into your jewelry. Please give us a call to speak to a trained gemologist at 1-888-436-7692 or email us at info@gemsny.com and we will guide you as to how to send your jewelry piece to us. How do I know if my order was successfully processed? You will receive an email confirming your purchase. If you do not receive such a confirmation, please contact us . Once you place your order you will receive an order confirmation via email. We will then begin working on your order. Once your order has shipped, we will email you the tracking number. Please email us at info@gemsny.com or call us 1-888-436-7692 for any questions relating to your order. Make sure to reference your order number. How much sales tax will I be charged? We do not collect sales tax for any order shipped outside of New York State. For orders shipped within New York State the current sales tax rate charged is 8.875%. I am an international customer (outside of the U.S.). Am I responsible for import duties, taxes or fees? Yes. You are responsible for all customs duties, taxes and fees associated with international shipments. All of our prices are exclusive of any duties, taxes and fees. Yes. We offer a 6-month interest-free payment plan for all color gemstone jewelry and loose color gemstone products over $750. Absolutely. Your privacy is important to us and we use the latest encryption technology to protect your online purchases, ensuring that your personal and financial information remain secure. We accept debit cards, however please note that banks treat debit cards differently than credit cards. Debit cards displays a credit card logo, such as AMEX or Visa, but a charge to your debit card draws funds directly from your bank account. As such, banks normally institute a daily charge limit on debit cards. If your order exceeds your daily limit, your order will decline. Please contact your debit card company to temporarily raise your daily limit prior to placing your order. Your credit card will be charged as soon as you place your order with us. We will process an order only after payment has been received. We offer free FedEx insured shipping to customers within the United States. Our international shipments carry a $50 charge and are shipped through FedEx Priority International service. All shipments are fully insured from the time your package leaves our premises to the moment you accept it. All FPO, APO, and DPO shipments will be shipped using the United States Postal Service priority mail service. All of our international and domestic orders are shipped with FedEx. All FPO, APO, and DPO shipments will be shipped using the United States Postal Service priority mail service. I need my item sooner - can I expedite my order? Yes, please contact customer service at 1-888-436-7692 to inquire if your order can be shipped prior to the expected ship date written on the website. We try our best to accommodate all requests. In addition, we offer expedited shipping options so your order can get to you in the timeframe you require. Yes. We offer Saturday Delivery service through FedEx and is available in most U.S. cities for a surcharge. If Saturday delivery is not available in your area, we can arrange for you to pick up your package at the nearest FedEx location. If you would like Saturday delivery, please call us at 1-888-436-7692 or email us at info@gemsny.com. Yes. Once your package has been shipped, we will email you with the package's tracking number. You can also email us at info@gemsny.com to inquire about your order status. Can you help me keep my gift a surprise? Yes. We understand that jewelry is often bought as a surprise and we often get requests to mail to alternate address other than your home, such as work. To protect you from fraud, if you request delivery to an address other than your billing address we require that alternate address be on file with your credit card company. No. To protect you from fraud, regardless of the size of your order, all packages require a signature upon delivery. Will you ship to military APOs or FPOs? Yes. Please note, all FPO and APO shipments will be shipped using the United States Postal Service priority mail service. What do I do if my gemstone or jewelry is damaged or lost during shipping? Rest easy - all shipments are fully insured from the time your package leaves our premises to the moment you accept it. If your gemstone or jewelry was damaged or lost during shipping immediately call us at 1-888-436-7692 and we will assess the situation and of course, try to make it right. For any package showing physical damage, please open and examine the contents in front of the FedEx delivery agent to confirm everything arrived safely. This will further protect you and will make the claim process easier. Do I have to be home to accept the package? Custom Jewelry items which we don't carry on the site that are hand crafted or designed in CAD based on customer requirements. Please note: Items which are from our Make Your Own jewelry such as make your own sapphire ring can be returned for a refund. Eternity Rings / Eternity Bands. Loose gemstone purchases that have been set into jewelry by a third party jeweler. Subsequent purchase under the Lifetime Trade-up. Please note the initial purchase is returnable subject to our 30-day return policy. Click here to learn more about Lifetime Trade-up. Please see our Return Policy for full details and instructions on processing a return. We believe that if you don't love your order, it shouldn't cost you anything to return your item. This is why we will pay for return shipping on all domestic orders that are returnable. Simply call us at 1-888-436-7692 to request a return and we will walk you through the process. Note, only one courtesy return label will be provided to a customer within a 6-month period. International customers will need to return items at their expense. Can I return a "Make Your Own" jewelry item? Yes. Make Your Own items are covered under our 30-Day Return Policy unless they have been customized. Can I return an engraved item? No. Unfortunately we cannot accept returns of engraved items as they have been personally customized. I'd like to return my order, but I can't find my certificate and/or appraisal? Certificates and appraisals are detailed documents created by expert gemologists from third party or our own laboratories. These reports are generally lengthy and detailed and quite expensive to replace. As such, we require that any returned items include their original certificates and/or appraisals. If any original certificates and/or appraisals are not included with your return, you will be assessed a replacement fee on your refund per document (minimum $125, but can be greater depending on the certificate or appraisal). Please understand, this is not a penalty, this is the cost to replace these documents. Can I return an item gifted to me even though I didn't purchase it? Our orders are only returnable to the initial purchaser. If the item is gifted, please contact the original purchaser to request a return or exchange. Returns generally take 2-3 business days for us to process from the receipt of the item. Please allow your credit card company additional 5-7 business days to process the refund. Are taxes and duties also refunded? We do not charge the taxes or duties associated with international shipments. Please contact any authority to which you've paid taxes or duties for instructions on how to claim them back. We do not appraise non-GemsNY gemstones or jewelry. We are not an insurer of jewelry, but our appraisal are accepted by all major insurers.